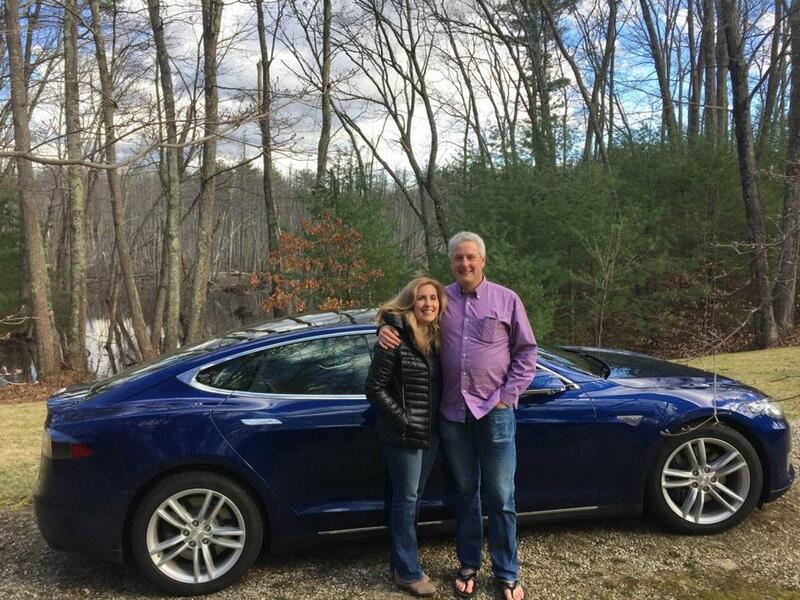 Al and Catherine Nierenberg won a new Tesla in a raffle held by ClimateXChange. BOXFORD -- Along a bend on Herrick Road, a meandering dirt path stretches out through swampy wetlands where every so often a beaver dam will flood the pathway. The path looks more suited for an ATV or dirt bike than a car, but in fact it’s the driveway to Al Nierenberg’s house in the woods. And now each time Nierenberg leaves his tucked-away home by car, he will be traversing the rugged terrain in an unexpected vehicle: a sporty, low-to-the-ground Tesla Model S 85D. Of course, the fact that he got the slick, futuristic car for free helps put things in perspective. Nierenberg received the energy-efficient electric sedan on March 16 after winning a raffle held by Climate XChange, a nonprofit organization that supports carbon pricing in Massachusetts. The $250-per-ticket raffle was aimed at raising money for the group and awareness for carbon pricing, an initiative that places fees on carbon emissions to promote alternative, green energy and move away from fossil fuels. Nierenberg, a green-energy advocate whose house is equipped with rows of solar panels, said he bought a ticket to the raffle primarily to support the organization. The new car came just in time for Nierenberg, whose 200,000-mile red Toyota Prius looks like an ancient relic compared with the metallic blue machine that now takes its place in the garage. Nierenberg and his wife, Catherine, were among the holders of more than 1,700 tickets hoping to win the top prize drawn at a New Year’s Eve event hosted by Climate XChange at raffle director Alan Langerman’s Wellesley home. 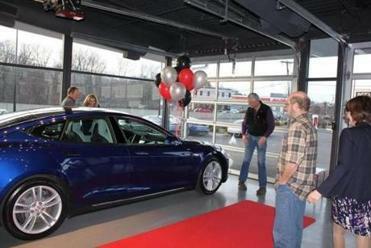 Al and Catherine Nierenberg received their Tesla at Tesla Motors in Dedham on March 16. The prize includes payment of state vehicle registration taxes and federal gift taxes, adding up to a total prize value of $147,000, according to Climate XChange. The Nierenbergs took delivery of their bounty from Tesla Motors in Dedham. Nierenberg, who says he will use the solar panels on his roof to charge his new car, said he is most excited about being able to reduce his carbon footprint. The president of his own consulting firm, Evergreen Consulting & Training, he has been a board member of several environmental organizations, including the East Coast Greenway Alliance, Appalachian Mountain Club, and Mass Audubon.